The Primarch sculpts by Forge World are always really cool looking and inevitably lead to some outstanding paint jobs. 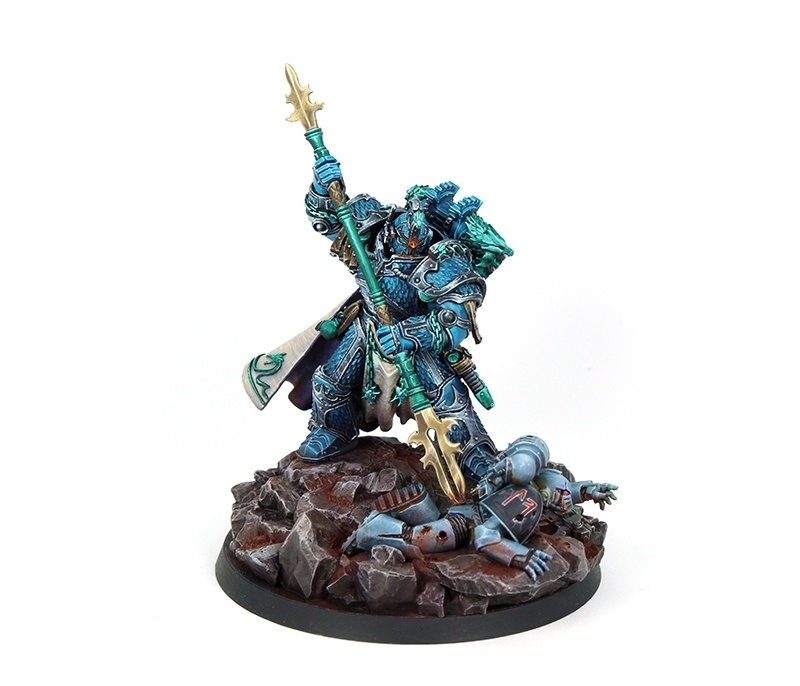 This Alpharius (or Omegon?) definitely exemplifies that standard. Looking at it just from a color theory point of view, I really like how, for the most part, everything is kept within the green and blue spectrum. 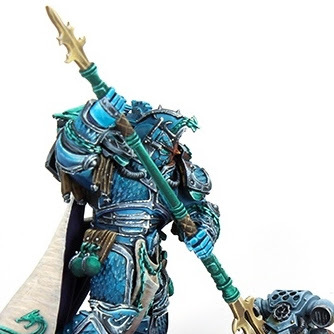 This definitely works for his armor, since that's their color scheme, but even the poor Space Wolf has a blueish tint to his armor. The colors that aren't blue or green tend to be neutral, like the cream of his cloak or the grey base. Everything except for the blades on his spear and the gem on his head of course. This draws your eye right to them and also form a triangle, keeping your eyes moving across the piece without leaving it. Everything is super smooth and crisp, with some really nice and subtle blends. I really like the tone of the green on his armor too, just on a personal level. The base is nice and simple, providing the context for the scene without distracting from the model. Even though it's mostly grey, it has a reddish brown dust worked into it to help contrast with the rest of the model. This is still kept fairly neutral though so your eye's don't get caught on it. This is a paint scheme that any Alpha Legion operative would be proud of.